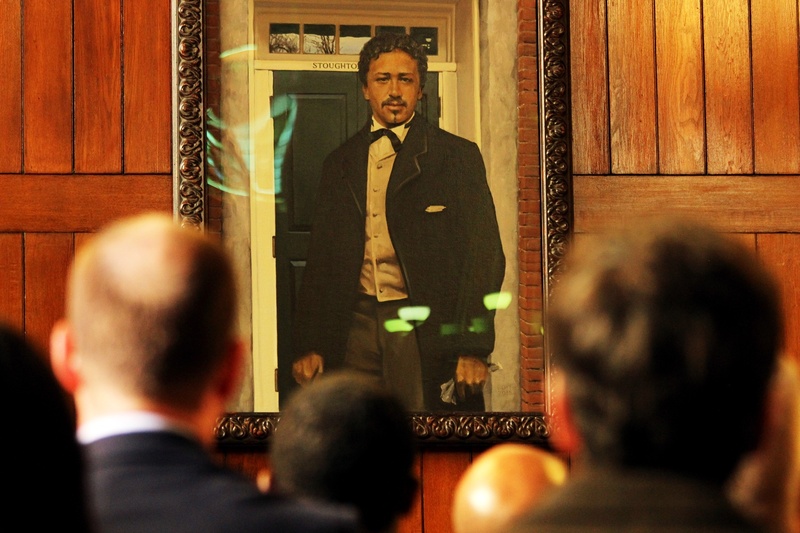 Amid songs, speeches, and roaring applause, Harvard administrators unveiled a portrait of Richard T. Greener, Class of 1870, the College’s first African American graduate, in Annenberg Hall. The portrait, which depicts Greener in front of his former home of Stoughton Hall, was unmasked by Harvard Foundation for Intercultural and Race Relations Director S. Allen Counter, following a performance by the Kuumba Singers and addresses by students and alumni. Students presented Greener’s portrait as part of the Harvard Foundation’s portraiture project, which aims to diversify the artwork—a majority of which currently honors white male alumni and faculty—decorating Harvard buildings. Administrators have hung portraits since 2005 as part of the project, including a portrait of Native American graduate Caleb Cheeshahteaumuck, Class of 1665, in Annenberg. Those speaking at the ceremony expressed deep admiration for Greener, who went on to law school and later became the University of South Carolina’s first black faculty member. In 1878, Greener was appointed as Dean of the Howard University School of Law. As an undergraduate, Greener won the Bowdoin prize for elocution in 1868 and 1870. 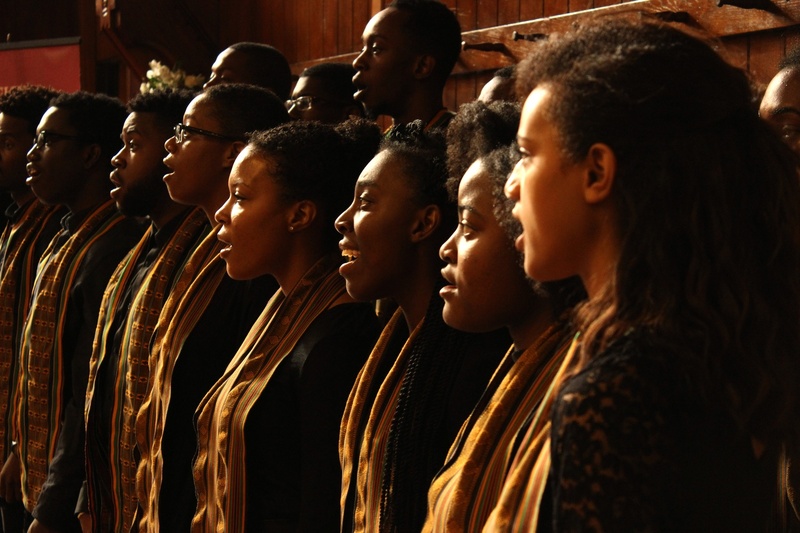 The Kuumba Singers of Harvard College sing in Annenberg Hall at the unveiling ceremony. Sheldon K. Reid ’96, director of the Kuumba Singers, said he found it “mind-blowing” that Greener was able to graduate from the College without structures that directly supported students of color—ones like the Kuumba Singers that Reid said provided relief and solidarity during his time as an undergraduate. He added that the portrait will also be helpful in reminding future students of color of their place at Harvard. “They can be reminded that [Greener] was worthy, and that likewise they are worthy,” Reid said. Harvard Foundation intern Devontae A. Freeland ’19 voiced similar sentiments, calling Greener “a shining example of the African American legacy.” Freeland, a Phillips Academy Andover graduate, also noted that Greener was the first African American alumnus of his high school. “My institution is making such an effort to value black life,” Marts said. Harvard has added diverse portraiture to facilities, a suggestion also voiced by students, since as early as 2005. In addition to Greener’s, other portraits include Archie C. Epps, one of Harvard’s first African American administrators, and Eileen Jackson Southern, the first black woman to become a tenured Harvard faculty. Earlier this year, a portrait of Reverend Peter J. Gomes became the first portrait of a person of color to reside on the walls of the storied Faculty Room in University Hall. —Staff writer Jalin P. Cunningham can be reached at jalin.cunningham@thecrimson.com. Follow her on Twitter @JalinCunningham.